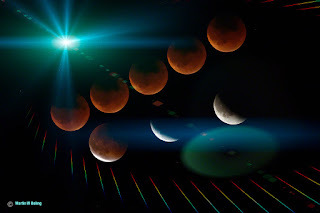 Super Blood Moon total eclipse September 27 -28, 2015. I know I am a little late posting this, but right after the event there was a crush of photos on the net. So here is mine. It's a time lapse of the moon during the total eclipse with three images of the moon coming out of the shadow of the earth. Of course I spiced up my image by adding some celestial effects using the Knolls Light-factory PS plugin. Enjoy!